Potatoes are easy to grow and is a beneficial survival food to grow in your own in-ground garden or container garden. Potatoes are the second most consumed food in the United States at an average consumption of 120 pounds per year (about one a day). The potato used as a survival food staple is ideal because it is easy to grow, nutritional, and able to store well for months at a time. It is a nutrition dense food with substantive calories. Horseradish is a good beneficial plant for the potato. It deters the Colorado beetle and blister beetle which can eat the roots of the potato plant. 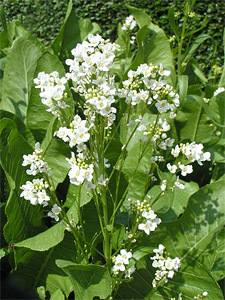 Horseradish is a perennial that will grow year after year, and is grown from a root cutting. In addition to the beneficial aspect to the potato plant, if you are harvesting the root, best to replant each year from a new fresh picked root for better flavor. Be careful because it can spread in your garden (plant in a container to keep in check). It will grow about 2 feet tall and across. 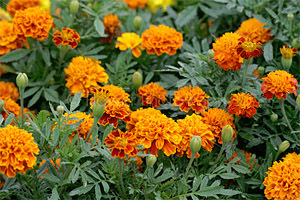 French marigolds will repel whiteflies and round worm nematodes which live in the ground and will eat the roots.